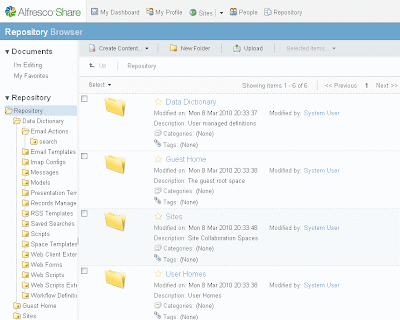 There's a cool but not-well-publicized feature of the Alfresco 3.2r release (February 16) in Alfresco Share -- general browsing of the entire Alfresco Repository from the Share interface. 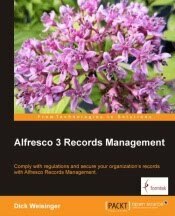 Paul Hampton, director of Product Marketing at Alfresco, briefly showed the feature in a webinar and later wrote a blog entry describing it. Since Alfresco is in the process of migrating functionality from their 'classic' explorer client application to Share, it makes sense that general repository browsing be migrated. Until this release, Share was only able to browse files in the document libraries of Share sites. The 'visible' flag needs to be set to true to be enabled. After making that change and restarting the server, you'll see a link to the repository on your Share home page along the top links to the right of the Share logo. After clicking on the Repository link, you'll then be able to browse the standard Alfresco repository. (You may need to F5/refresh your browser cache to see it.) You can upload files, create folders and create new content.